Buku Clutches are quickly becoming recognized as the ultimate clutch for the On-Road GT class. The amazing durability of the Komposite shoes together with the ability to achieve very high spring tensions combine to deliver truly unmatched performance. Superior performance and the tremendous cost saving realized by running Komposite shoes makes the Buku Clutch the clear choice for GT racers. 1/8th Scale Clutch Kit with 34MM Flywheel, ABK Shoes and High Tension Springs. 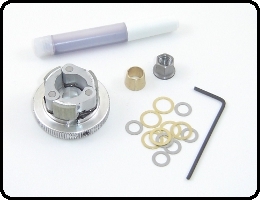 Complete kit with pre-assembled clutch, collet, SG style nut, hex wrench, shims and special Buku threadlocker. The 34MM flywheel is the most common size for GT vehicles. This kit with standard weight shoes tends to be preferred by racers using Off-Road motors. Komposite shoes require use of a NEW clutch bell. 1/8th Scale Clutch Kit with 34MM Flywheel, Light Weight ABK Shoes and High Tension Springs. 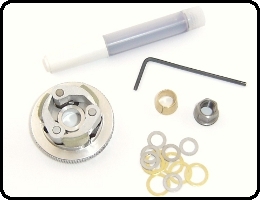 Complete kit with pre-assembled clutch, collet, SG style nut, hex wrench, shims and special Buku threadlocker. The 34MM flywheel is the most common size for GT vehicles. This kit with standard weight shoes tends to be preferred by racers using On-Road motors. 1/8th Aluminum Bonded Komposite Shoes and High Tension Springs. Fits all Buku 1/8th Scale flywheels. 1/8th Light Aluminum Bonded Komposite Shoes and High Tension Springs. Fits all Buku 1/8th Scale flywheels. Assorted extra shims for clutch installation. 1/4”-28 thread. Fits all SG cranks. 2ml Pen Tube of special Buku Threadlocker. Also available in 10ml bottle.